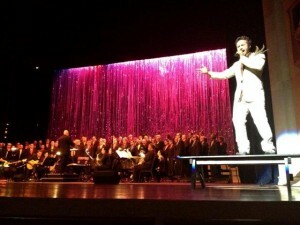 Let Mylar Rain Curtains add some dazzle to your show! We here at Rent What? are thrilled to have been a part of a recent showcase put on by The Denver Gay Men’s Chorus in Denver, Colorado, called Rocket Man: The Music of Elton John. 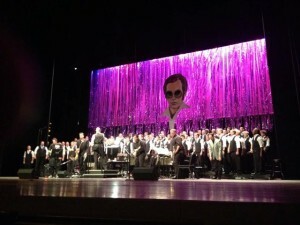 With a virtually sold out crowd, Scott Scoffa and the folks at Rocky Mountain Arts Association presented this amazing show which took place at Gates Hall at the Newman Center for the Performing Arts on the Denver University Campus. 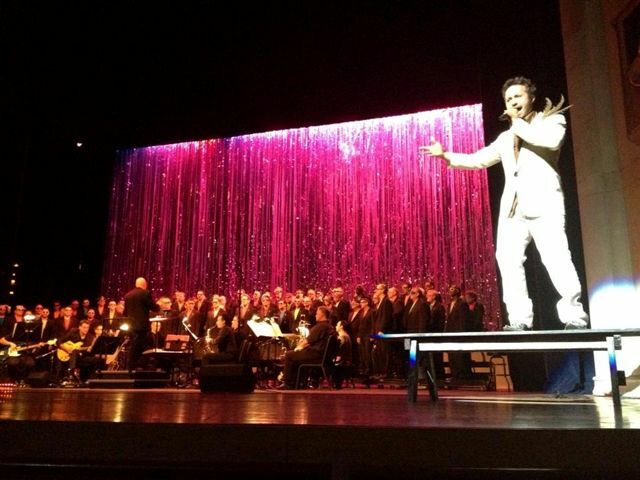 This show had everything—captivating music and singing, beautiful lighting, dramatic costumes, and of course it was all topped off with two of our gorgeous rental Silver Mylar Rain Curtains as the perfect backdrop for this unique and dazzling show. From our Oh So Swanky! Drapery Collection, these Mylar Rain Curtains are very lightweight and easy to install, as well as extremely versatile for use in many occasions. You can completely change the atmosphere of your show with a splash of some colorful lighting. Or try adding some drapes from one of our other drapery rental collections, like an Aluminum Mesh Drape from our Industrial Textures Collection or a Silver Satin Swag from our Silver Satin Collection, to really get a truly fresh look for your special event. We were so happy that our Mylar Rain Curtains worked out so perfectly for our clients at the Rocky Mountain Arts Association, and we can’t wait to see what stage design they come up with for their next big performance! We love it when our clients come up with unique and creative ways to use what would normally be just an “ordinary backdrop”. Recently a very imaginative client of ours used one of our white poly muslin backdrops for a very special event indeed, and we could not have been more impressed with how everything turned out! 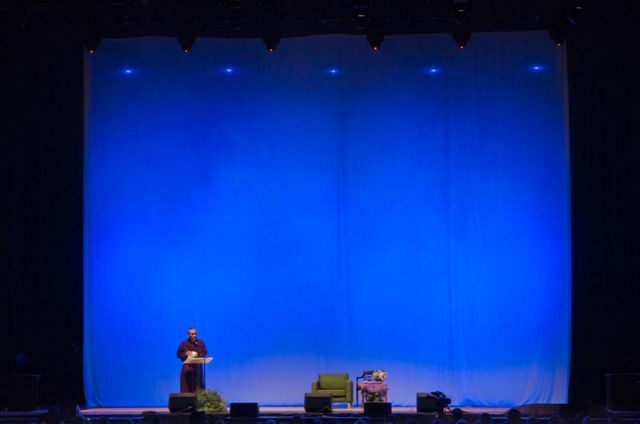 Oregon’s premier lighting and audio visual company Hollywood Lights was involved with creating a beautiful yet functional stage for an extremely special guest to the Portland area, His Holiness the Dalai Lama. 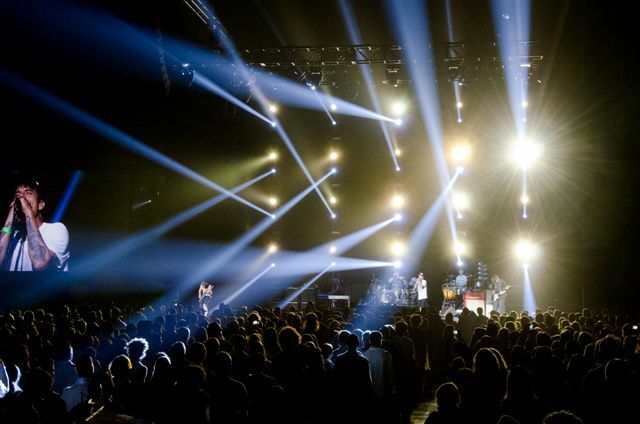 He would be participating in an environmental summit and discussions about compassion at the Veterans Memorial Coliseum in Portland, Oregon, so Kerrigan O’Neill and the entire team at Hollywood Lights needed to be able to design staging that would allow for both panel discussions and keynote addresses in the morning and early afternoon, and then be immediately followed by a huge rock concert with the Red Hot Chili Peppers that very same day. How they would be able to have everything already set up for the concert, while not distracting from the panel discussions and speeches happening concurrently on the same stage, was something that O’Neill and his team at Hollywood Lights had already ingeniously figured out. Utilizing our theatrical rental 30’h x 40’w White Poly Muslin Backdrop as their main showpiece, O’Neill and his team were able to create a more intimate space for the discussions happening earlier in the day near the front of the stage, and by lighting it differently for each guest, they were able to help define the mood and feel for each dialogue that occurred. Having the entire back end of the stage essentially “hidden” from the crowd also enabled the band’s crew to have all of their staging, instruments, and gear set up and ready to go at a moment’s notice. 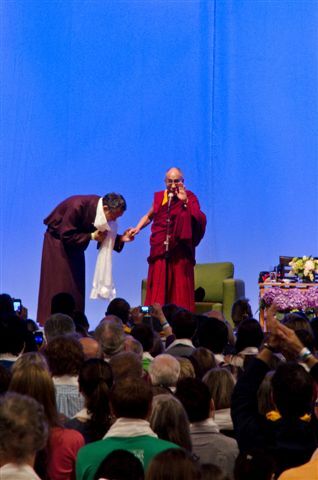 They wanted the enraptured audience be able to focus as much attention on The Dalai Lama as possible, without having any distracting sights or sounds from the back end of the stage interrupt His Holiness’s important discussions. O’Neill’s team then used one of our dependable and easy-to-install 10-head Solenoid Systems to drop our white poly muslin drape at the push of a single button, enabling the RHCP to begin their performance right away. This was an extremely important feature, so they wouldn’t have to make the audience wait around for the hour+ it would have taken to do a typical change-over. Photographer Lindsey Rickert captured all of the significant moments from the day; everything from all of the special guests that participated in the discussions with the Dalai Lama, to the incredible rock concert immediately following. 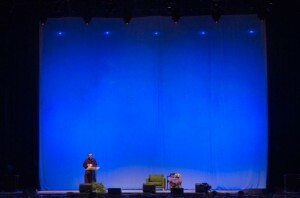 We were so delighted and impressed with how well everything came together, and were thrilled that our theatrical rental drape and solenoid system were a part of such a meaningful and successful event. Last year, Megan posted about the expanded content on the Sew What? / Rent What? channels on You Tube and Flickr. Well, in the last month or so, we have added a number of You Tube videos to our channel, and so I wanted to give our blog readers a preview. Ever wondered how a Sniffer (sometimes called a Snifter) Drape works? Check out this video. Superimposed on this video of inductee Heart performing are details on the stage softgoods provided by Sew What? and Rent What? This video highlights the details of the construction of this amazing cut drop utilizing FR Black 16oz Commando Cloth, Black Sharkstooth Scrim and Metal Mesh. These three videos are just a taste of the many videos – both entertaining and informative – on our You Tube channel. If you haven’t visited lately, I encourage you to check it out. This is National Small Business Week. To be honest, I wasn’t even aware that there was such a thing! But when I learned of it by chance yesterday, I was intrigued and wanted to learn more. In 1963, President John F. Kennedy signed a Presidential Proclamation instituting National Small Business Week, making 2013 the fiftieth anniversary. The week is to honor the nation’s entrepreneurs, and each year a National Small Business Person , selected from a group of 54 State Small Business Persons (from the 50 states, plus the District of Columbia, Puerto Rico, U.S. Virgin Islands, and Guam), is honored by the Small Business Administration in a variety of co-hosted events. During the week, the Small Business Administration also hosts a number of events and workshops throughout the country providing hands-on assistance and mentorship to small business owners. This year, these events are being held in Seattle, Dallas, St. Louis, Pittsburgh, and Washington DC., with content streamed live on the National Small Business Week website. As the General Manager for two small businesses, it is gratifying to see this type of recognition given to entrepreneurs and small businesses. I hope you will join me in congratulating not only the State and National winner of the award, but also all of the small business owners throughout the country and the world. In my next installment of “Meet the Staff”, I would like to re-introduce you to one of the company’s most veteran employees, Shane Nelson. We’ve talked about this very special person in blog entries before, but I wanted to make sure and officially introduce him to our readers so they can see for themselves how innovative, creative, and hard-working he is. Shane’s incredible eye for detail has helped produce some of the most interesting and inspirational stage designs for our clients we’ve ever seen. Please take a moment and read a little bit about why we are so thrilled to have Shane as a member of our SW? family! When did you first start at Sew What? What were you originally hired to do, and how have your duties changed since working here? I began working here at Sew What? over 8 years ago as a Sales Rep and have had basically the same duties here ever since. However, because of my prior experience in this business, I have been lucky enough to get to work on some of Sew What’s larger projects. 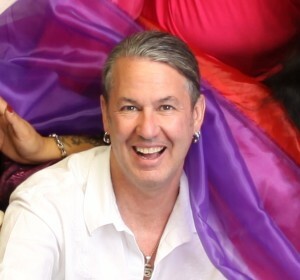 I am now Sew What?’s Creative Director and Senior Sales Rep, which I truly enjoy. What kind of work did you do before coming to Sew What? I have worked as a large-scale party planner, and for over 30 years as a set and stage decorator, as well as an Art Director and Production Designer in Hollywood. I was fortunate enough to be able to design sets for music videos, television shows, movies, and stage productions of all kinds. One of my proudest jobs was working for the Salt Lake City Winter Olympics Bid Committee. I was sent to Budapest to be able to personally help set up the displays for this bid, and I was able to be on stage back in Utah when we were officially chosen to host the 2002 Winter Olympic Games. After all of that hard work and energy, it was extremely gratifying, and also very exciting! If you could take a vacation to anywhere in the world, where would you go? I would go to Paris! I am an official “foodie” and am completely taken with the food, art, culture, and architecture of that beautiful city. I love to paint watercolors and acrylics, mostly scenery and nature. I have also been playing guitar my whole life—I learned with the Classical Spanish style, but enjoy playing lots of other styles, too. I have also learned how to play some piano, too. What is your favorite memory from being part of the Sew What? family? I have really enjoyed all of our “outside work” social functions—it’s a great opportunity to get to know my colleagues on a more personal level, and be able to enjoy one another in a less professional environment. We always have so much fun! What is your favorite sports team/TV Show/Book/Movie? I absolutely love the television show “Dexter”, and I can watch “Phantom of the Opera” as a movie or play over and over again. I’m not a huge fan of sports normally, but I am totally addicted to watching the Olympics every time they are on—of course, I will always have a huge interest in watching the Winter Olympic Games, no matter where they are being held! I have substituted doing any personal hobbies for working on our Spanish Colonial house—it takes up pretty much all of my extra time. We just finished doing a new roof for the house, and we enjoy working on indoor and outdoor remodeling of all kinds. I have just as much fun puttering in our yard as I do almost anything else! What project have you worked on recently that was interesting or challenging? Recently I’ve worked on some custom mixed media backdrops for some internationally famous performers. Working with their production designers, I was able to utilize my experience and knowledge of art directing to help produce one-of-a-kind creations never seen before. It was very challenging, but also very rewarding to see the end results. Anything more about your time here at Sew What? I have always enjoyed all of the company’s outside excursions and events, and look forward to being able to have a lot of fun with my co-workers!